The California State Assembly approved legislation which would allow terminally ill patients to be prescribed medication to end their lives. This was the second attempt to pass the bill, following the 2014 case of Brittany Maynard. Last November, Maynard, who was diagnosed with brain cancer, decided to move from California to Oregon so she could access the state’s “Death with Dignity” law and legally end her life. Before her passing, Maynard recorded videos pleading with lawmakers to pass the act in California and other states. According to the Los Angeles Times, the End of Life Option Act would require patients to submit two oral requests, at least 15 days apart, plus a written request which would be signed in front of two witnesses. The attending physician would personally receive all three requests. Assemblywoman Cheryl Brown (D-Rialto) told lawmakers about her son, who was near death. Doctors urged her to let him go. Nineteen days later, he came off life support. He survived, and is now a husband and father. “Doctors don’t know everything,” Brown said. Assemblyman Luis Alejo (D-Watsonville) argued the bill would allow those suffering from terminal illness to end their suffering in a peaceful and dignified manner. Alejo’s voice choked with emotion as he talked about his father, who is in pain suffering from terminal bone cancer, and how his father wanted to make his own decisions about the end of his life. “Respect his choices,” Alejo said. The proposal will now go to the Senate, then onto Governor Jerry Brown. If the measure is approved, California will become the fifth state to legalize physician-assisted suicide, joining Washington, Oregon, Vermont and Montana. 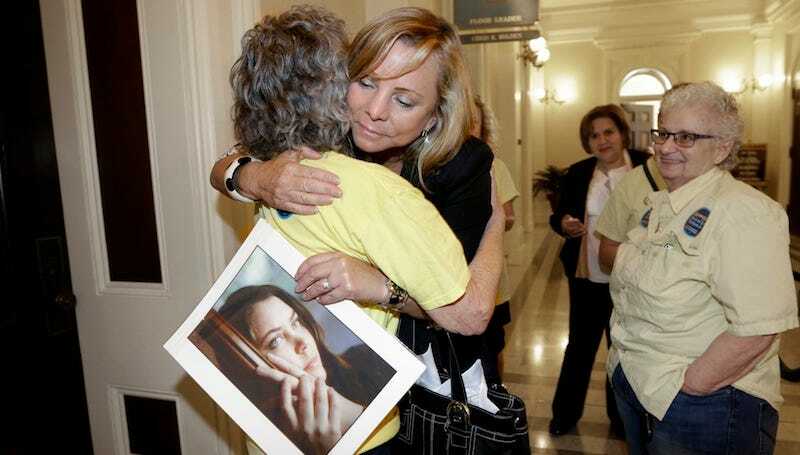 Image of Debbie Ziegler, holding photo of her daughter Brittany Maynard, via AP.